Dust storms have been observed on planet Earth as well as on Mars. A dust storm or sand storm is a meteorological phenomenon common in arid and semi-arid regions. Dust storms arise when a gust front or other strong wind blows loose sand and dirt from a dry surface. Particles are transported by saltation and suspension, a process that moves soil from one place and deposits it in another. The Sahara and drylands around the Arabian peninsula are the main terrestrial sources of airborne dust, with some contributions from Iran, Pakistan and India into the Arabian Sea, and China's significant storms deposit dust in the Pacific. It has been argued that recently, poor management of the Earth's drylands, such as neglecting the fallow system, are increasing dust storms from desert margins and changing both the local and global climate, and also impacting local economies. The term sandstorm is used most often in the context of desert sandstorms, especially in the Sahara, or places where sand is a more prevalent soil type than dirt or rock, when, in addition to fine particles obscuring visibility, a considerable amount of larger sand particles are blown closer to the surface. 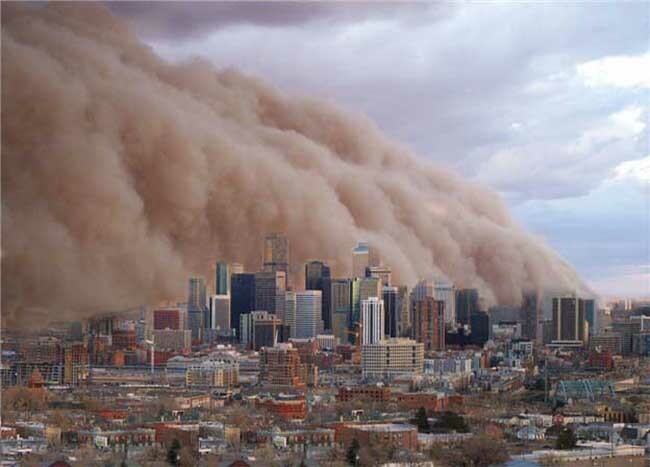 The term dust storm is more likely to be used when finer particles are blown long distances, especially when the dust storm affects urban areas. As the force of wind passing over loosely held particles increases, particles of sand first start to vibrate, then to saltate ("leap"). As they repeatedly strike the ground, they loosen and break off smaller particles of dust which then begin to travel in suspension. At wind speeds above that which causes the smallest to suspend, there will be a population of dust grains moving by a range of mechanisms: suspension, saltation and creep. A recent study finds that the initial saltation of sand particles induces a static electric field by friction. Saltating sand acquires a negative charge relative to the ground which in turn loosens more sand particles which then begin saltating. This process has been found to double the number of particles predicted by previous theories. Particles become loosely held mainly due to drought or arid conditions, and wind has varied causes. Gust fronts may be produced by the outflow of rain-cooled air from an intense thunderstorm, or they may represent a dry cold front, that is, a cold front that is moving into a dry air mass and is producing no precipitation. This is the type of dust storm which was common during the Dustbowl years in the U.S. Following the passage of a dry cold front, convective instability resulting from cooler air riding over heated ground can maintain the dust storm initiated at the front. In desert areas, dust and sand storms are most commonly caused by either thunderstorm outflows, or by strong pressure gradients which cause an increase in wind velocity over a wide area. The vertical extent of the dust or sand that is raised is largely determined by the stability of the atmosphere above the ground as well as by the weight of the particulates. In some cases, dust and sand may be confined to a relatively shallow layer by a low-lying temperature inversion. In other instances, dust (but not sand) may be lifted as high as 20,000 feet (6,100 m) high. Drought and wind contribute to the emergence of dust storms, as do poor farming and grazing practices by exposing the dust and sand to the wind. Dryland farming is also another cause of dust storms, since dryland farmers rely on rainfall to water their crops, they engage in practices to maintain moisture in the soil. Such practices include leaving a field fallow for a year after harvesting to allow the buildup of water to build in the soil and covering the field with dry earth in an attempt to seal in the underlying. These practices make dryland agriculture susceptible to dust storms. These methods are used by farmers in eastern Washington, an arid region. A sandstorm can transport large volumes of sand unexpectedly. Dust storms can carry large amounts of dust, with the leading edge being composed of solid wall of dust as much as 1.6 km (0.99 mi) high. Dust and sand storms which come off the Sahara Desert are locally known as a simoom or simoon. The haboob is a sandstorm prevalent in the region of Sudan around Khartoum,with occurrences being most common in the summer. Saharan dust storms have increased approximately 10-fold during the half-century since the 1950s, causing topsoil loss in Niger, Chad, northern Nigeria, and Burkina Faso. In Mauritania there were just two dust storms a year in the early 1960s, but there are about 80 a year today, according to Andrew Goudie, a professor of geography at Oxford University. Levels of Saharan dust coming off the east coast of Africa in June (2007) were five times those observed in June 2006, and were the highest observed since at least 1999, which may have cooled Atlantic waters enough to slightly reduce hurricane activity in late 2007. Dust storms have also been shown to increase the spread of disease across the globe. Virus spores in the ground are blown into the atmosphere by the storms with the minute particles then acting like urban smog or acid rain. Prolonged and unprotected exposure of the respiratory system in a dust storm can also cause silicosis which, if left untreated, will lead to asphyxiation; silicosis is an incurable condition that also may lead to lung cancer. There is also the danger of keratoconjunctivitis sicca ("dry eyes") which, in severe cases without immediate and proper treatment, can lead to blindness. Dust storms cause soil loss from the dry lands, and worse, they preferentially remove organic matter and the nutrient-rich lightest particles, thereby reducing agricultural productivity. Also the abrasive effect of the storm damages young crop plants. Other effects that may impact the economy are: reduced visibility affecting aircraft and road transportation; reduced sunlight reaching the surface; increased cloud formation increasing the heat blanket effect; high level dust sometimes obscures the sun over Florida; effects on human health of breathing dust. Dust can also have beneficial effects where it deposits: Central and South American rain forests get most of their mineral nutrients from the Sahara; iron-poor ocean regions get iron; and dust in Hawaii increases plantain growth. In northern China as well as the mid-western U.S., ancient dust storm deposits known as loess are highly fertile soils, but they are also a significant source of contemporary dust storms when soil-securing vegetation is disturbed. 524BC The 50,000 strong army of Cambyses II supposedly buried by a sandstorm en route to the Siwa Oasis. 400AD The Chinese Silk Road city-state of Niya was abandoned rapidly, perhaps because of a sandstorm, as local legend would suggest. The sand has preserved the city to such an extent it has been referred to as the "Pompeii of the Silk Road." 1930s: A series of dust storms displaced hundreds of thousands of agricultural workers in the central United States and Canada during the Dust Bowl. 1934: Just one of many notable storms in the 1930s, the storm of 9-11 May 1934 began in the far north-western Great Plains and proceeded east over the northern tier of states and parts of Canada and was notable for removing the vast majority of the soil deposited since the last Ice Age over some parts of its path. 1935: Another major dust bowl storm took place on April 14, which became known as Black Sunday. 1954-1991: The multi-year droughts in portions of North America of 1954-56, 1976-78, and 1987-91 were noted for dust storms of the intensity seen in the middle 1930s over some fraction of their coverage and timespan, and more sporadically during the times between. The three multi-year droughts were similar to the 1930s in storms being raised by synoptic scale weather events such as cyclones and cold fronts; otherwise the most common trigger is the outflow from convective activity, known as a haboob. Significant events of the latter variety occurred in Colorado and Kansas in May 2004 with winds to 100 mph, Minnesota and Wisconsin in June 2004 causing significant damage, and the upper Middle West in May 1988, notable for strong electrification and lightning activity and by one estimate reaching 30 000 ft or more. The first and third of this list reached black blizzard intensity, causing total blackout for some period ranging from 90 sec to 10 or more minutes, over some fraction of the ground covered. The 1987-91 drought was especially notable as in the 1930s for the large number of rain of mud events, often generated by dust in suspension and/or carried on upper-level winds. 1971: A dust storm that occurred near Tucson, Arizona on July 16 was extensively documented by meteorologists. 1983: 1983 Melbourne dust storm: On the afternoon of February 8 a huge dust storm originating in the Mallee region of Victoria, Australia covered the city of Melbourne. 1997: On May 2, a sandstorm in Libya and Egypt killed 12 people. 2007: On Saturday afternoon February 24, a large dust storm originating in the West Texas area of Amarillo covered much of the North Texas area. Strong winds caused extensive property damage to fences, roof shingles, and some buildings. The DFW Airport was severely affected, causing extensive flight delays into and out of the DFW area. Area residents suffered respiratory problems and allergic reactions, causing many people to visit hospitals. This event was also marked by relative humidities down to 1 per cent, in one case the juxtaposition of a c. 70�F air temp and dew point of -20�F, in and around of the area affected. 2007: In June, a large dust storm generated by Cyclone Yemyin struck Karachi, Pakistan and areas of the Sindh and lower Balochistan, followed by a series of heavy rainfalls which resulted in a death toll of nearly 200. 2009: On February 11, a sandstorm in the Kingdom of Bahrain in Sakhir halted Formula One testing for Ferrari, BMW and Toyota. 2009: On March 11, a massive dust storm engulfed Riyadh in the Kingdom of Saudi Arabia, causing major traffic jams and all flights to be cancelled or diverted. 2010: 2010 China drought and dust storms: A sandstorm that started in Mongolia blasted Beijing on March 20, and covered large areas of China in the following days. Several countries in East Asia were affected. Hong Kong, Taiwan, Japan and South Korea recorded extremely poor visibility and air quality in an extremely rare level 5 hazardous rating. A number of residents reported health problems, while flights were canceled or delayed due to poor visibility caused by the sandstorm. 2011: A major dust storm swept through the southern portion of the Desert Southwest U.S. State of Arizona on Tuesday, July 5, 2011. The dust storm was triggered from thunderstorms to the south of the Phoenix metropolitan area. Dust from the deserts were blown up by high winds. The winds were estimated to be over 60 miles per hour and caused low visibility. The storm went through the city of Phoenix a little after 7:00 p.m. local time. The event was captured and filmed by local media and was seen live on national television channels such as The Weather Channel. Local flights in the area were delayed because of the storm. Power outages were also reported. 2011: On March 25 2011 - At approximately 5.30 PM (GMT +3) a dust storm swept through Kuwait turning the setting evening sun to immediate darkness reaching minimal visibility in mere minutes. What first seemed to be smoke from a burning building,but it was a sand storm. 2012: February 25, an extreme dust storm attacked Riyadh in the Kingdom of Saudi Arabia, where it became totally dark at only 4:00 P.M. local time.